This is not a book that I wanted to read. So many times while reading books about the Holocaust, I feel a disconnectedness from the events. It's a mixture of two things. The first is that the sheer scope of events is just too large, too horrific, for one person's words to do justice to it. The second, and this could partly be due to the first problem, is that I detest being manipulated by my books. With a lot of Holocaust literature the villains are stock characters; the malevolent Colonel with no humanity, staring cold-eyed at the prisoners before sending them off to their deaths. I find this to be a drastic over-simplification of the tragedy and one with a great potential for allowing such a dehumanizing event to occur again. It's simple to hate Count Dracula or Emperor Palpatine. They have no identity aside from their thirst for power and willingness to inflict any cruelty for any whim. They are a delightfully uncomplicated type, divorced from standard concepts of morality- purely evil. Nazis, quite understandably, get tarred in this same way. We see the pictures of bodies stacked hundreds of feet high at Bergen-Belsen, the haunted eyes staring out past barbed wire, the jackboots marching in lockstep, The Triumph of the Will- these are all images etched into the collective memory. No civilized person could do such a thing, the mind recoils. These are not people but demons brought to Earth. This is a phenomenal disservice to those who suffered so horrifically at their hands. How can we properly work to prevent such a travesty from ever occurring again when we choose to reject these people from the human community? We need to understand what can move someone to such a place that pushing the button to fill a shower with Zyklon B is just another day at the office. We need to see how easy it is to give in to what Hannah Arendt dubbed the "banality of evil." To recognize those aspects within ourselves and then to strive to work against them constantly. Allowing Nazis to become human in our mind does not excuse any of the crimes they committed. Rather it opens us up to the understanding that the same potential exists in all of us. When we understand this, that we all have the capability of becoming something monstrous simply through acquiescing to the dominant trends in society, by going with the flow, only then can we truly make strides in guaranteeing the truth of the mantra "Never Again." And it is easy, this acquiescence. It is as easy as taking a new job to avoid having a shameful secret found out at an old one. The next thing you know you're guarding prisoners at a work camp. From there, it's just another small step to selecting who gets shipped back to Auschwitz and who stays. The option for rebellion doesn't even raise its head; either you do the task or someone else will, raise a fuss and you may just find yourself on the train with them. Next step you find yourself standing outside a flaming church, hundreds of women locked inside and, though you have a key, you do nothing simply because nobody told you to and to release the women would mean to set them free (which was definitely verboten). That's all it takes. A simple abdication of responsibility and 300 women cook within the stone walls. Please believe, understanding does not equal forgiveness. It does not mean you have to like that person one iota, but an effort should be made to see how such things are possible- how each decision moved them further and further down the road to the Nuremberg Tribunal. 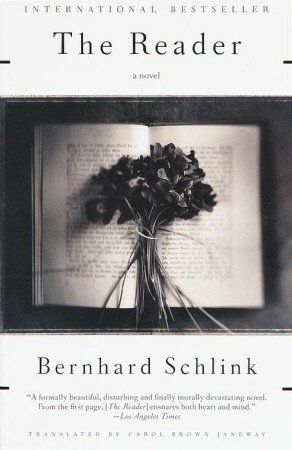 Yet, as Schlink's main character, Hanna Schmitz, asks in especially gripping moment, "What would you have done?" How do you get off that merry-go-round when its already spinning? Delightfully, the author does not hand the reader a satisfactory answer, for what possible answer could there be? The book was not all death, doom and gloom. That's just the bit that struck me the hardest, because the author built such an affinity between myself and Hanna. Seduction via literature has to be my favorite thing ever and the early scenes where this takes place were some of the most tightly coiled eroticism I've ever had the pleasure of reading. Later, when the scope of what Hanna has done becomes clear, the reader, much like the young narrator, must reconcile his affection for her with these revelations. It's a struggle, to be sure, but one that helps make The Reader one of the most impacting books I've yet read. What you're saying about understanding needs to be said and said and said again. Thanks for saying it here, Logan. This is a great review. Beyond how true everything you say is, I find it wild that even though everything about the Holocaust in this book made me think along similar lines (just not so eloguently) I was so much more focused on the relationship. It's rise and it's downfall. In all, I thought this was a great story on two different levels.